Sometimes more lymphatic fluid can build up in the tissues than the lymph system or circulatory system can accommodate. Lymphatic drainage massage – or more formally as oedema massage in clinical circles – is a specific massage technique that assists in the reduction/elimination of this lymphatic fluid build-up. 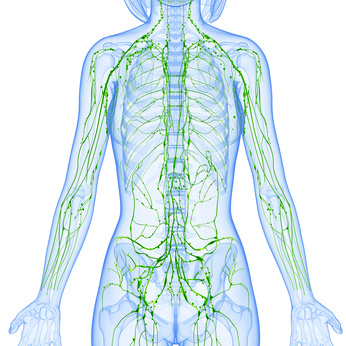 The lymphatic system is secondary circulatory system in our bodies which cleans and nourish cells. Lymph is a clear fluid containing nutrients and oxygen similar to blood but without the red and white corpuscles, and is deposited around cells to keep them nourished. The cells discard waste and toxins into the lymphatic fluid which is then moved away via the lymphatic vessels to lymph nodes. These then filter the lymph fluid and release it back into the lymphatic circulatory system. Notably lymphatic fluid only ever flows in one direction, which is away from the cells and towards the heart. What goes wrong with lymphatic circulation? The lymphatic system is dependant on muscle & body movements to circulate lymphatic fluid, unlike the blood circulatory system which is pumped around its network by the heart. The lymphatic system also relies on the body to be in good condition with sufficient fluid intake, good nutrition to function correctly. When there is a lack of movement, or the body is not in optimal health, lymphatic circulation is impeded leading to congested, swollen and often painful limbs. Also referred to as ‘Lymphodema‘, this painful and disabling condition is due to a congested lymphatic circulatory system. 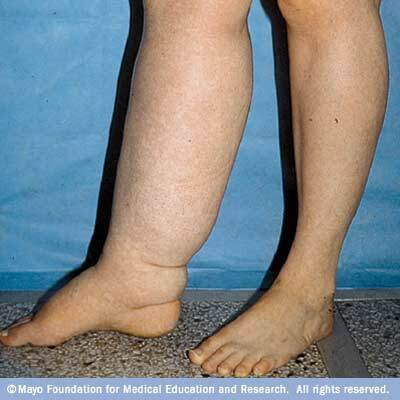 The image right courtesy the Mayo Foundation shows a person suffering from an enlarged right leg due to lymphoedema. Apart from the obvious inconvenience, this is a very painful condition. Fortunately lymphoedema can be effectively treated with lymphatic drainage massage for a reasonably prompt and drug-free relief. How does lymphatic drainage massage help? Lymphatic drainage massage gently coaxes movement of the lymph reducing the swelling and providing relief from the pain. Massage strokes direct congested lymphatic areas into the correct direction to reduce the localised pressure or oedema. In some cases complex lymphatic therapy is required, and this may involve bandaging and compression garments. A number of conditions typically respond well to a lymphatic drainage massage.